Today Luke used the toilet for the very first time! We’re so proud of him! However, there is a story to how he got there. We are trying out some new diapers that have Diego from Go Diego Go on them. While I was changing Luke’s diaper, Luke saw Diego on the new diaper and he wouldn’t let me put it on him because he wanted to look at it. So, I let him keep that one and I went to get a new one. Well, when I turned around from getting another one, Luke was peeing on my dining room carpet. I yelled, “NO!”, at him and he stopped. So, I scooped him up and walked him into the bathroom where I put him on the toilet with a training seat. There he continued to go potty in the toilet. I praised him greatly, but I think he was still upset that I yelled at him before. Anyway, I continued to praise him and even had Alyce come and praise him hoping he would realize that he had done a very good thing when he used the potty. He seemed pretty excited that he got to flush the toilet. I know it’s the just the beginning of potty training and I don’t think he’s too interested in using the potty yet, but it’s a start and I’ll take it! 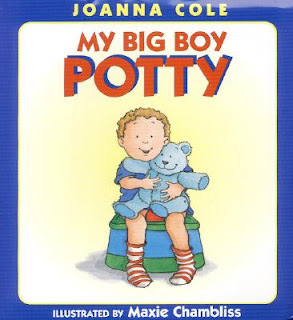 I also plan to buy a book, My Big Boy Potty, that's like one we got for Alyce while she was potty training that seemed to help her get interested in the potty. Hopefully, it will help Luke out too.